Top: Students take selfies with a very approachable Stephen Smith. Bottom: Commerce students in front of banners outside Goodes Hall that dropped the moment Principal Woolf announced the school’s new name. 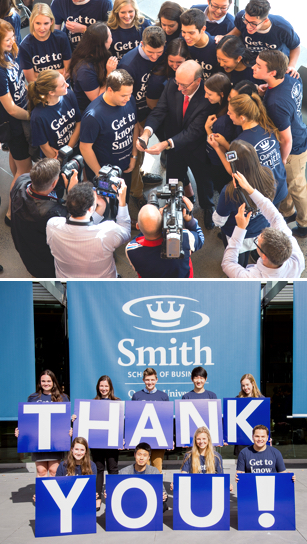 Kingston, ON — Oct. 1, 2015 There was a buzz of anticipation when students, faculty, staff and VIPs assembled in the Goodes Commons today for a “major announcement.” The standing-room-only crowd erupted in applause and rose to its feet when Principal Daniel Woolf announced that Queen’s alumnus Stephen Smith, BSc(Eng)’72, has donated $50 million, the largest gift ever made to a Canadian business school. Mr. Smith addressed the crowd with humility and dry humour. He reflected on his Queen’s experience as an electrical engineering student who gravitated towards economics in his choice of electives. He gave tribute to two former professors, former principal David Smith and Economics Professor Richard Lipsey, who encouraged him to continue his studies at the London School of Economics. Following his graduation from LSE, he embarked in a house-building business, which failed. “Some of life’s greatest lessons are learned the hard way,” said Mr. Smith. “My next venture went well, and it has one that has occupied my business interests for over 25 years.” His businesses include First National Financial Corporation, Canada’s largest non-bank lender of residential and commercial mortgages, and Canada Guaranty Mortgage Insurance. “The remarkable endowed gift will support new chairs and professorships to attract and retain the best faculty, and new scholarships to continue to attract top students,” said Dean David Saunders. 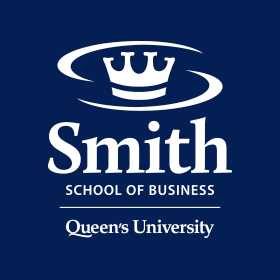 Get to know Smith and learn more about the impact of this truly transformational gift at smith.queensu.ca. View the video of the announcement here.